The lymphaticovenular anastomosis (LVA) procedure has been commonly indicated in early-stage lymphedema. There has been a long quest as for the most effective site of performing LVA, but anatomical and clinical studies suggest that the collective lymphatic vessels running along the great saphenous vein are one of the most effective lymphatic vessels for effective LVA. Whether done under general anesthesia or infiltrative local anesthesia, the LVA on these lymphatic vessels is usually performed with patients in the supine position, with the supination of the hip joint of the subject lower extremity to expose the medial aspect of the lower extremity. This position inflicts burden not only on patients, especially ones with relatively advanced lymphedema, but also on microsurgeons who have to either stretch out their arms, looking through diagonally positioned microscopes, or look at a surgical field where most regions are out of focus because the vertically positioned microscope is looking at a slanted surgical field. To address these issues, we propose a simple solution: lateral crisscross position for LVA. When performing LVA on the medial aspect of the lower extremity, we place the patient in the lateral decubitus position, with the subject lower extremity on the bottom. Using foam wedges, pillows, and towels, we flex the hip joint and the knee of the contralateral lower extremity to maintain a favorable surgical position, both for the surgeon and the patient ([Fig. 1]). 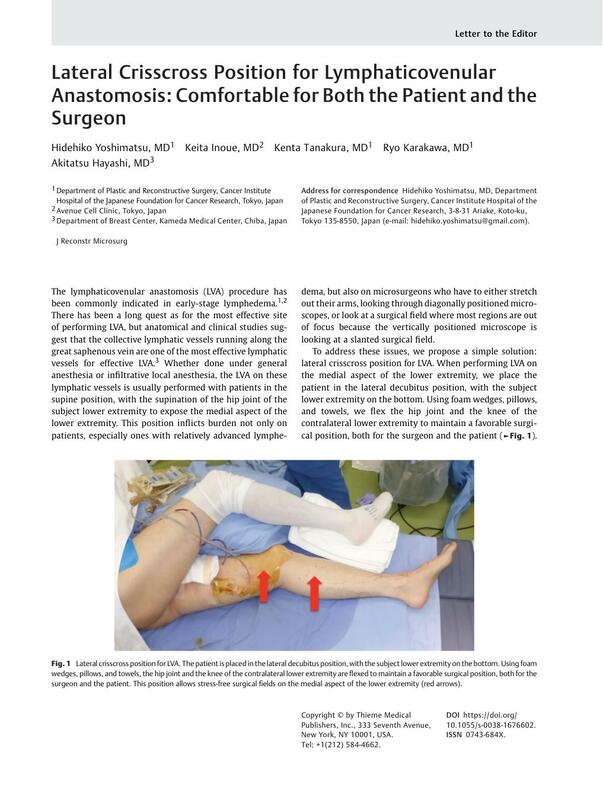 The whole lateral aspect of the subject lower extremity is placed on the surgical table, so the patient's movements are limited to the minimum level even when the LVA is performed under infiltrative local anesthesia. By simply taking this surgical position, the surgeon can focus on the surgical procedure with a comfortable posture, resulting in shorter operative time, which is also advantageous for the patient. As described by Seki et al, the lymphatic vessels run deep in the adipose layer above the knee joint, which alone renders LVA in this region stressful and challenging; the lateral crisscross position allows precise execution of supermicrosurgical procedures by precluding the abovementioned obstacles. Fig. 1 Lateral crisscross position for LVA. The patient is placed in the lateral decubitus position, with the subject lower extremity on the bottom. Using foam wedges, pillows, and towels, the hip joint and the knee of the contralateral lower extremity are flexed to maintain a favorable surgical position, both for the surgeon and the patient. 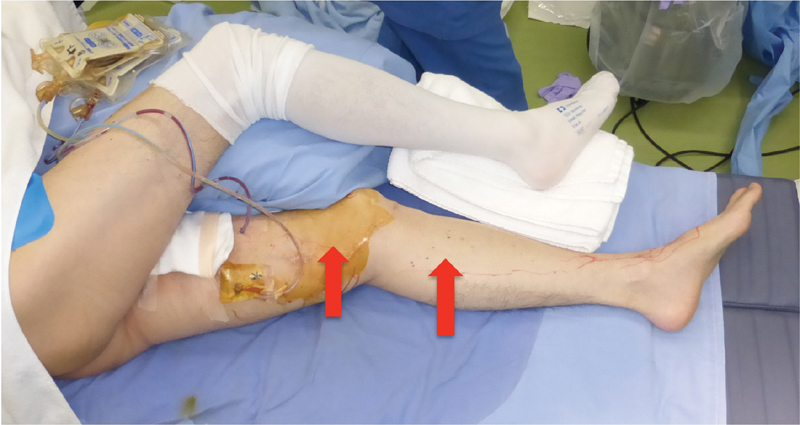 This position allows stress-free surgical fields on the medial aspect of the lower extremity (red arrows). This report was published with the consent and permission of the patients involved.